Elegant yet understated, this crystal column floor lamp from Possini Euro Design is sure to please. The perfect addition to modern decor, this crystal column floor lamp features five glass columns rising from a stacked base to a crisp linen shade. With two pull chain switches that control the light output. 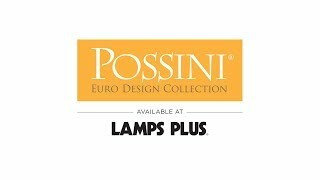 From the Possini Euro Design Collection. Overall: 62 1/4" high. Base is 1 1/4" high x 10 1/2" wide. Shade is 12" high x 19" wide. Weighs 35 lbs. Two maximum 100 watt or equivalent bulbs (not included). Twin pull chains. 8' brown cord. Oil-rubbed bronze finish over metal construction. Clear crystal glass rods. Linen shade. Elegant column floor lamp from Possini Euro Design®. I bought 2 of these lamps. One is great. The other had to be returned due to a severed power cord. The replacement which arrived had some water/humidity damage, has flaws in the glass and is not even close to being straight even with floor pads. Hi Andrew J., very sorry to hear that one of your lamps and its replacement had these issues. Our customer service team would like to make this right for you, so please reach out to them via phone, email, or chat so they can provide some solutions for you. Thank you.